Localization, as we know it today, has grown leaps and bounds to accommodate people from 190 countries with significant differences in dialects. The trend of adapting content or product to a region dates back to the 1980s when American software giants began deploying their software in countries outside the USA. Today, brands across the world not only translate their content to regional languages but also curate content specific to the likes and tastes of a region. Popular examples of well-crafted localization strategies are Coca-Cola, Microsoft and Nike. At Ulatus, we track brands that do exceptional work with their content localization and shatter language barriers to increase their presence in global markets. Netflix’s viewing data reveals that nine out of every ten people who watched the German TV series Dark lived outside of Germany. In another report by Quartz India, the top shows watched by people in India are Narcos, Stranger Things, 13 Reasons Why, Riverdale, Black Mirror, and Chef’s Table, among others. This is a classic example of a successful globalization & localization strategy. 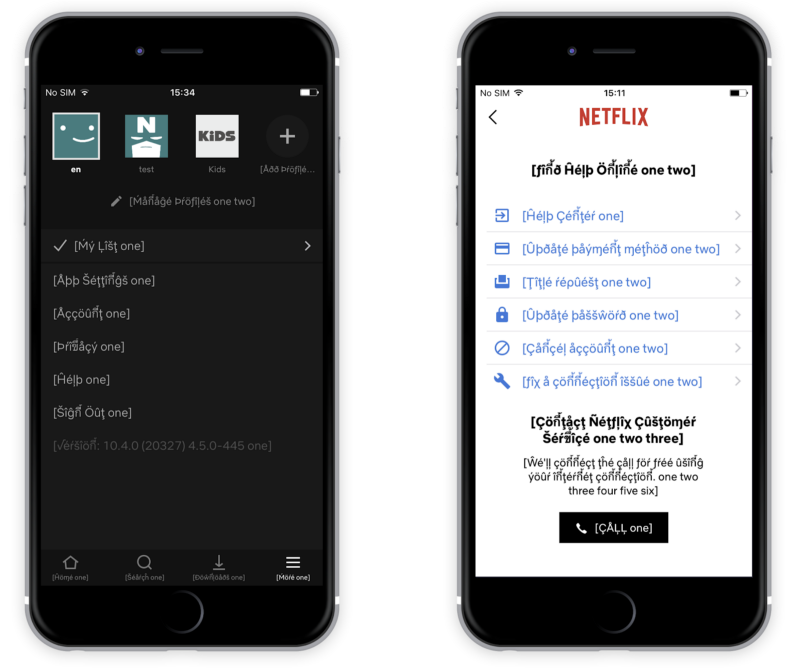 Netflix is able to capture such a vast global audience by allowing users worldwide to view subtitles in a language of their choice or choose a dubbed version of the show or movie. But localization doesn’t end there for Netflix; they’ve even localized the app navigation and UI for different countries. They scale their UI design using a technique called Pseudo Localization to account for 25+ languages and scripts. In Pseudo localization, the software assigns space for one, two or more words after the standard English text to account for increase in total characters required for a different language. All these efforts have definitely paid off. Netflix began operation in 1997 as an online DVD rental store based out of California. In 2007, they launched their streaming platform primarily for the US market with about 7.48 million subscribers (most of who had subscribed to the DVD rental service). Since then the viewer base grew year on year and soon Netflix started expanding the streaming business to different countries. As of 2018, Netflix has more than 148.46 Million subscribers from across the world. For the first time, more than half of its subscribers (54.6% to be precise) are outside the United States, bringing the international total to more than 52 million users. 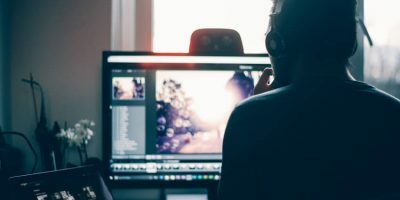 As a global brand, Netflix is extremely cautious about the quality of translators they work with and has an entire Partner Help Centre to ensure high-quality translations and dubbing. The folks at Netflix have a thing called the show and movie bible in which they give deep insights about the elements and specifics of movie or show to ensure that the essence of content is maintained. Slack, founded in 2012, is an app that aims at making communications faster, simpler and fun for work teams. They began operations by pitching the product to friends and contacts in American companies and got 8-10 firms to try the app and share feedback. Since then Slack has grown to include a large user base of 500K companies and 8 million daily active users of which 3 million pay for more features and benefits. A Slack spokesperson told VentureBeat that more than half of its users are in more than 100 countries outside of the United States. 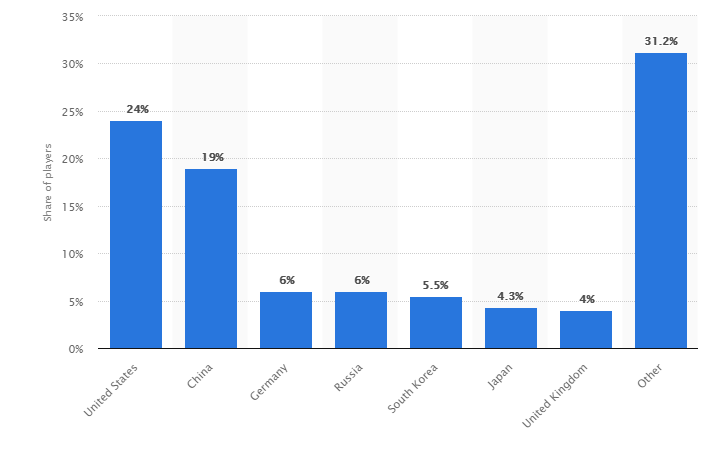 The top five countries outside of North America who use Slack are United Kingdom, Japan, Germany, France, and India. While countries like India and UK use English as the primary business language, Japan, Germany and France use their regional languages. 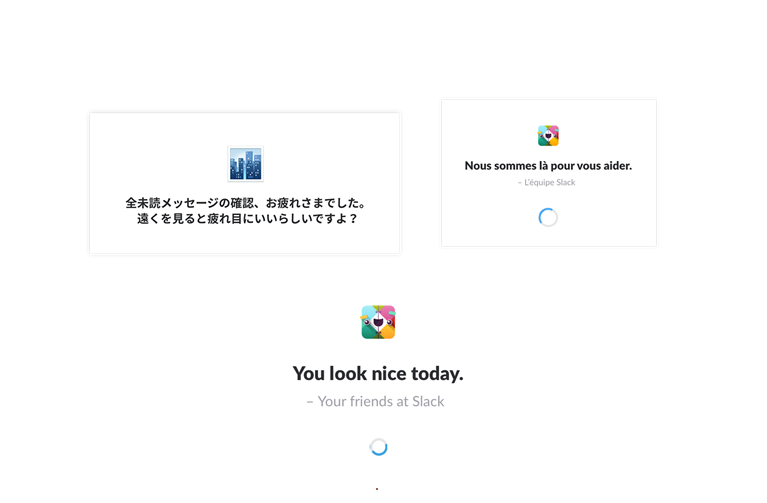 To increase their user base and to build a stronger connect with users in other countries, Slack decided to localize it’s app for a number of different regions. Users all over the world have responded to this localization strategy positively. Apart from the general “Welcome to Japan” and “Welcome to Spain” tweets, a lot of users have asked for the app to be localized to their countries like Turkey and Arabic. Pubg, a game developed in Korea by Irish photographer and avid gamer Brendan Greene in partnership with Bluehole, Inc is 2017-18’s most popular game with more than 400 million players worldwide. This chart by Statista shows the percentage of players from different parts of the world. While it wasn’t easy, Pubg Corporation has been able to build such a massive player base by translating and localizing its content. The game is available in 11 languages apart from English helping players understand instructions and game hooks better while building a stronger connect with the game. According to a study by USC Institute of Creative Technologies, California, players seek games for enjoyment and for emotional experiences. The game has a bunch of instructions for players to follow. By restricting the language of the game of English or any other one language, players from different countries of the world won’t enjoy the experience as much as they would if the game was in a language they understood. And if players aren’t enjoying the game, there are high changes they abandon it and don’t come back. Countries also differ in their likes, perceptions, and the extent of violence they can take. For a game like When Pubg was introduced in China, the Chinese government raised a concern that the game was too violent and inappropriate for release in the country. To counter this problem, Pubg offered to change characters and tone down the violence in the game for the Chinese audience. Two versions of the game, Army Attack (air, water and land battles) and Battlefield (similar to Pubg mobile) were released. Following NetEase’s strategy, Pubg also decided to include China’s socialist views in the game. This has moved China up to rank 2 as the country with most players with 19% of the world population playing the game from the country. Getting insights about the preferences and limitations of a country isn’t an easy task and best left to experts. Partnering with the right game translation and localization company can help increase your game’s player base worldwide. Swedish electronics brand Electrolux made an error in their English tagline when they introduced their vacuum cleaners in America. Instead of supporting the sales function, the tagline went completely against the product and company. While some would appreciate the company’s try at humor (if that was the case, and not a clear translation error), many would consider this an attempt at belittling oneself and not buy the product. 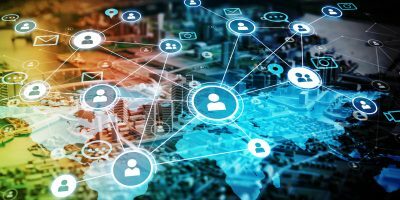 To avoid such errors, top brands like Netflix, Johnson & Johnson, Toyota, and Sony partner with language solution providers who manage localization and translations for them. These experts can guarantee content that is error free and resonates with the audience of a region because they hire the world’s best translators and editors. 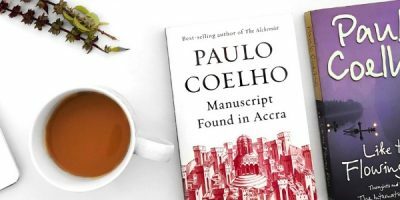 These translators and editors understand the region, its culture, popular idioms and phrases and follow processes that make it hard to make mistakes. We, at Ulatus are one such language solution provider that 200,000+ clients from 125 countries trust. We have a translator and editor pool of 3000+ experts who are specialized in subjects such as tech, marketing, life sciences, finance, and more. We’ve worked with some of the world’s biggest brands on a number of projects and have ensured a 99.45% customer satisfaction score. If you are interested in growing your business and building a global customer base, get in touch with Ulatus.